If it's not your first time here, you probably know that I enjoy cooking and baking with booze. 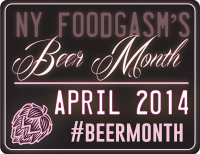 I'm even the resident Boozy Food Fanatic over at Food Fanatic. While I usually turn to my liquor cabinet shelves, I also include wine and beer in that category. Yes, I also drink booze, but bring it into the kitchen with the same fervor. I love matching the nuances of a particular drink with smells, flavors, and ingredients to turn them into something tasty. 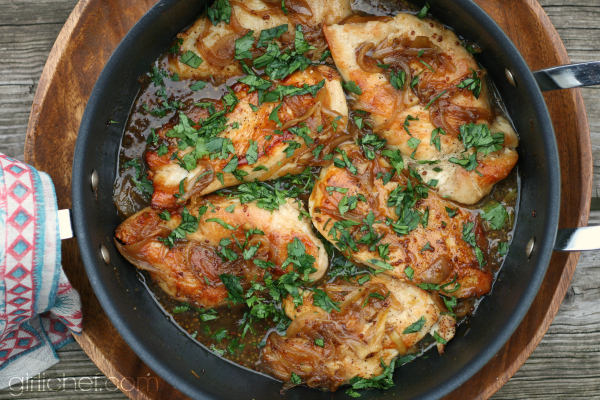 These simple chicken breasts are one example. I started with an amber beer. Or should I say, una cerveza ámbar - Dos Equis Amber Lager. Mustard and beer are natural companions, but I also wanted some sweet and tangy flavors to add to the sauce. For the sweet, I turned to Piloncillo; those lovely brown cones of unrefined cane sugar. To balance out the deep, rich flavor of that, I added some cider vinegar. Once all of those flavors bubbled and thickened a bit, I finished with handful of cilantro for a little brightness in every bite. I found the perfect accompaniment to be just some plain white rice, because it soaks up the juices and sort of mellows out the whole thing perfectly. If you're using a local craft beer, or even a domestic beer, you could try substituting the sweetener and even the type of vinegar to match. Scatter it with a different fresh herb to match the flavors that you chose. I think that anyway you decide to take this dish, you'll be happy. Hooray for cooking with beer! 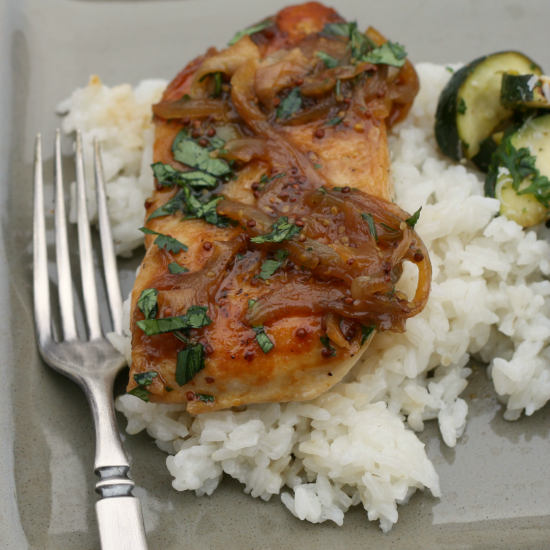 Chicken breasts coated in a sweet and tangy beer and whole grain mustard glaze make for a quick and flavorful supper when served with rice and vegetables. Sprinkle the chicken breasts with salt and pepper. Heat oil in a large nonstick skillet over medium-high heat. 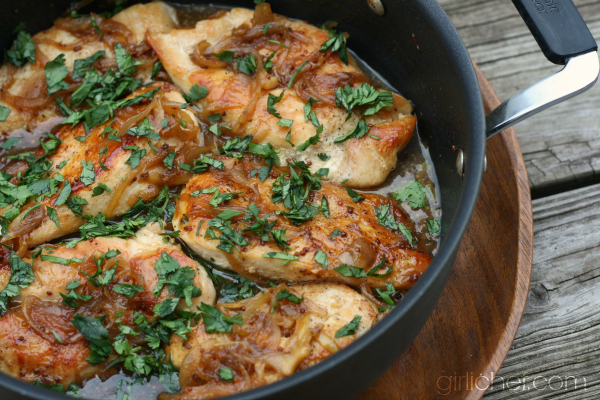 When the pan is hot, add the chicken breasts. Don't crowd them because you want them to brown nicely - do this in two batches if necessary. Saute until cooked through, ~12 minutes, flipping once the first side has a beautiful golden sear on it. Remove to a rimmed plate. Add the sliced onions to the pan and cook until just soft and nicely colored, 3 minutes. Sprinkle the piloncillo over the onions and add the mustard; stir for 30 seconds. Pour in the beer and cider vinegar and bring to a boil. Cook until the liquid has reduced by about half, 5-7 minutes. Nestle the chicken back into the pan, turn off the heat, and scatter the cilantro over the top. Serve with some plain white or brown rice (it soaks up the juices nicely and balances the sweetness of the sauce) and some veggies. Enjoy! note: I used Piloncillo (an unrefined whole cane sugar) for the sweetness in this recipe, but if you can't (or don't want to) find it, you could use dark brown sugar, maple syrup, or even honey in its place. If you substitute, adjust amount to taste.